To which I thought: Bully for them but what does it mean? If I was the CEO of Asda, Aldi or Tesco what could I do with such a banner-blaring piece of information? Well, nothing. But being of curious mind, I started to think more about this bandied-about term, Brand Value, as it relates to food retailers. I wondered how it related to the cash value the market places on a company, ie, its share price. 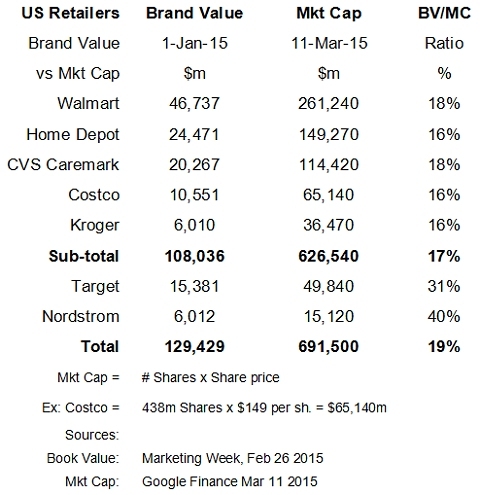 So I compared the Brand Value to the Market Capitalization of some well-known US bricks-and-mortar retailers nestling comfortably among the 32 featured as The World's Most Valuable Brands, in Marketing Week, Feb 26, 2015. What Does the Table Say? Frankly, I was surprised that the first five retailers I chose, a cross-section of the traditional mass-retailing sector, had such similar Brand Value (BV) to Market Capitalization (MC) ratios, ie, around 17%. Does it mean in the case of Costco, for example, with a recent share price of $149, about $24 (16%) is due to the company's Brand Value and $125 (84%) is due to other factors? It's fair to wonder what the other factors are; and, given Pareto's Law, should management really be focusing on the 84% and not the 16% to build its business? Incidentally, apart from one monthly coupon booklet Costco rarely advertises, so it's fair to ask how can it have a BV/MC ratio similar to either Kroger or CVS, both heavy advertisers? With the ratios of these five companies being so strikingly similar, further exploration was required. Two other traditional retailers, Target and Nordstrom, were found with higher ratios: Target's is partly explained by its recent share price drop following its Canadian withdrawal announcement, but why Nordstrom is so different is unclear. Perhaps the answer lay in the definition of Brand Value. A web search found various definitions of Brand Value including "orporate image or perception", "the amount spent on marketing," and the "sum of a company's core functional and emotional benefits." Unfortunately, without an accompanying step-by-step worksheet showing the breakdown of assumptions and calculations we can't grasp what Brand Value really is. And a CEO therefore doesn't know what he or she should do to improve this wonderful-sounding ephemeral number. One thing that did intrigue me is that, from year to year, Brand Value has often increased and decreased along with its company's sales and profits. Does that mean Brand Value foreshadows or follows its sales and profits? Why should a company's Brand Value drop if sales and profits drop? Surely, that suggests Brand Value is more fickle than substantive in nature. My curiosity's next question asked who produces these brand rankings that are promulgated far and wide? Is there a Certified Marketing Brand Value Body of Accountants (or the like) that gathers annually to perform the calculations? Who are its members? What are the component elements of Brand Value drawn up by this body and how do they ascribe value to each element for each company? Are the elements and values they use audited? Until we know, what credence should their pronouncements hold? I certainly hope they are not like Oscar judges selecting the Best Movie of the year. Indeed, why do they even bother? We already know the answer from Box Office sales. In the middle of the recent Oscars Ceremony the emcee, Neil Patrick Harris, mentioned how the Box Office sales of American Sniper was greater than all the other Best Picture nominees combined. In the eyes (and pockets) of movie viewers the decision had been made. Ah, but not so on the ballot slips of the Oscar judges (mostly male and white with an average age of 62, somewhat different from the average movie goer). They chose another movie to be Best Picture. Like Brand Values, who decides? Is their value system logical and transparent? Otherwise, what does the accolade really mean? How Often Does Brand Value Change? This, of course, will depend upon the formula used in its calculation. Does it change daily like Market Capitalization because of the volatility of one of it's two components, share price, or is it slow to change because the customer emotional and relational value to a company (however that is measured and quantified) is slow to change? If so, how is that measured and quantified over time and by whom? Cui bono? Who benefits? So a segment of the marketing profession regularly issues a list of those companies with the greatest Brand Values. Now, if a retailer can't measure or manage its Brand Value, who benefits from this ranking that appears to be influenced by the amount spent on various forms of advertising? The answer to that question I'll leave to you. Brand Marketing is a term widely seen in the marketing press yet what it means is murkily unclear. If any reader can point me in the right direction to clarify the issues raised I would be most appreciative. In the meantime, I have turned to Shakespeare for some guidance regarding how food retailers should view Brand Value. Adapting from Macbeth's final soliloquy: It is a term, full of sound and fury, signifying nothing.